When PC World decided to name the ten worst PCs of all time, it was a virtual lock that a Packard Bell machine would grace the list at number one. The only question was, which model? It was an impossible choice. Part of the problem was Packard Bell's strategy of selling nearly identical systems under different names, depending on where they were sold. So the Packard Bell Legend 406CD hawked at Circuit City was more or less the same as the Axcel 467 on the shelves at Staples or the Force 480CD sold at CompUSA, making apples-to-apples (or in this case, lemons-to-lemons) comparisons impossible. 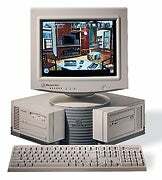 But in other ways Packard Bell was maddeningly consistent. Between 1994 and 1996 the company was a perennial bottom dweller in PC World's reliability and service ratings. One out of six Packard Bell machines sold at retail was returned by dissatisfied customers--more than twice the industry average. And odds are good that if you bought a new Packard Bell system in 1994 or 1995, at least some of its components had been previously owned. The company was sued several times for selling used parts as new, ultimately paying out millions of dollars in settlements. After Packard Bell merged with NEC in 1996, things got a little better. But when Packard Bell exited the US market in 2000 to focus on selling machines to European consumers, few users on this side of the pond shed any tears.